Kimchi is amazing to cook with since it is extremely low calorie and packed with flavor. Kimchi Bokumbap is cheap and easy to make in a short period of time. 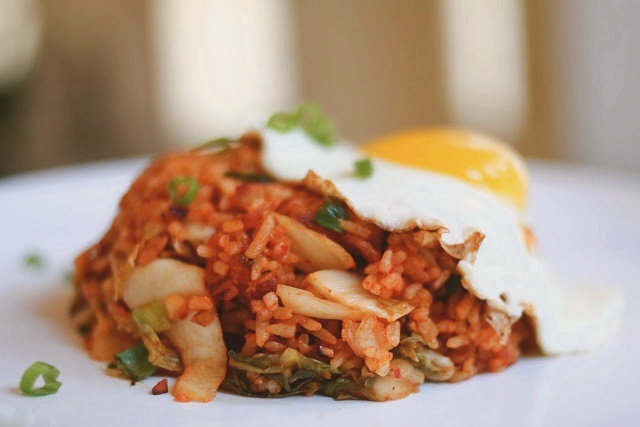 Korean Kimchi Fried Rice (Bokumbap) can consist of various choices in meat and chopped kimchi (or leftover Kimchi), which is then sauteed together along with other vegetables such as onions, garlic and green onions. This recipe serves 3. Other similar recipe – Nasi Goreng Pattaya, Kimchi Making Clip. Saute kimchi and onion in a lightly greased large pan over medium heat for a few minutes. When vegetables begin to look transparent, add ½ Tbsp of butter, garlic, and soy sauce and saute for another 2-3 minutes. Add meat and continue to saute until meat is cooked. Cook a little more and turn off the heat. Add rice and rest of butter, spring onions and mix all ingredients well. Put Bokumbap on a dish and place a fried sunny egg side up on top. Enjoy this dish with Sambal Belacan! So delicious! Very good site, and the photos are very impressive!